In this episode of Two Guys to the Dark Tower Came, we conclude The Dark Tower, Book 2, The Drawing of the Three, Final Shuffle. Next Episode: May 31; We start The Dark Tower, Book 3, The Waste Lands, Bear and Bone. 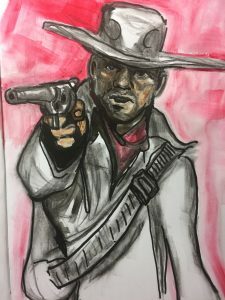 In this episode of Two Guys to the Dark Tower Came, we explore The Dark Tower, Book 2, The Drawing of the Three, The Pusher. Romper Room “Do Bee” song from Romper Room, Jim Timmens, Golden Chorus, and Golden Orchestra. New York : Golden, 1964. Next Episode: May 17; We finish The Dark Tower, Book 2: The Drawing of the Three discussing the Final Shuffle and the book as a whole. In this episode of Two Guys to the Dark Tower Came, we explore The Dark Tower, Book 2, The Drawing of the Three, Shuffle. Next Episode: April 5; We explore The Dark Tower, Book 2, The Drawing of the Three, The Lady of Shadows. In this episode of Two Guys to the Dark Tower Came, we explore Book 2 of the Dark Tower, The Drawing of the Three, The Prisoner. Next Episode: March 22; We cover Book 2 of the Dark Tower, The Drawing of the Three, Shuffle.